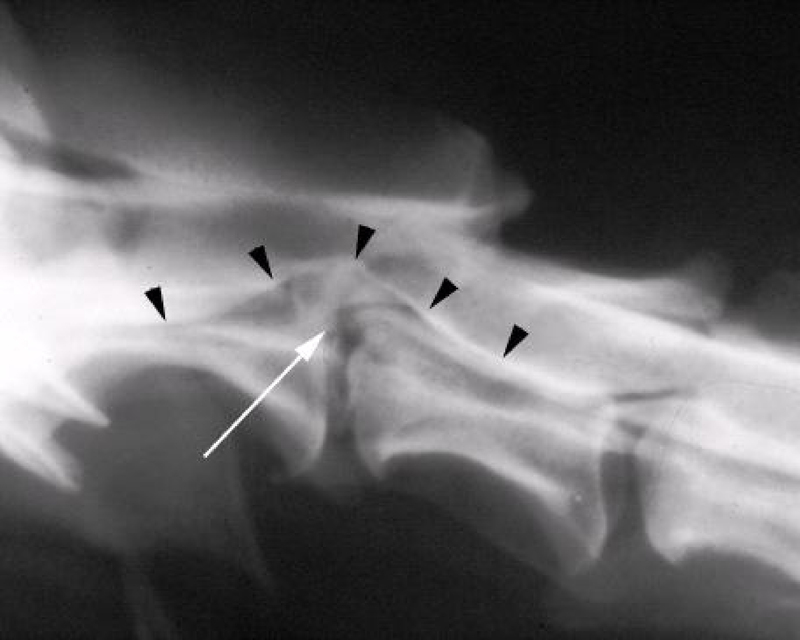 Figure 18-1: Dog with multiple spinal cord tumors (black arrowheads) outlined by myelography. 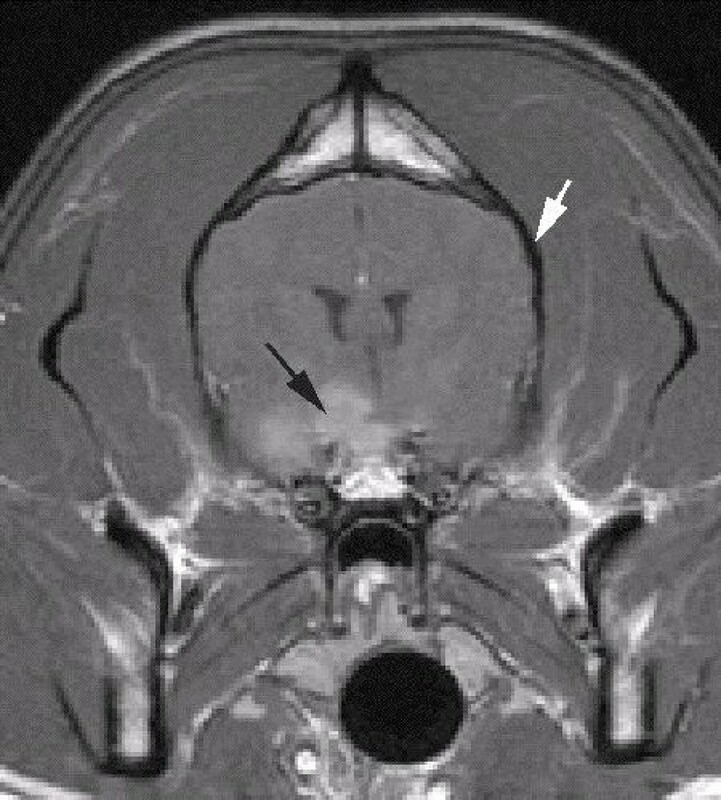 The tumors displace the myelographic contrast agent that is mixed with spinal fluid (CSF) and so appear as dark masses surrounded by a white halo of contrast. The contrast can also be seen as a white line at the top and bottom of the spinal cord (white arrows). The brain and spinal cord are buried deep within your pet’s body and unfortunately they do not show up at all on an X-ray. Either a dye has to be used to outline the spinal cord (see Figure 18-1) or advanced imaging studies need to be done using either a CT scan (Figure 18-5) or an MRI (Figures 18-7, 19-1). X-rays are nevertheless very useful in certain conditions, such as discospondylitis (Figure 18-2). Spinal X-rays remain an important diagnostic tool in veterinary neurology. 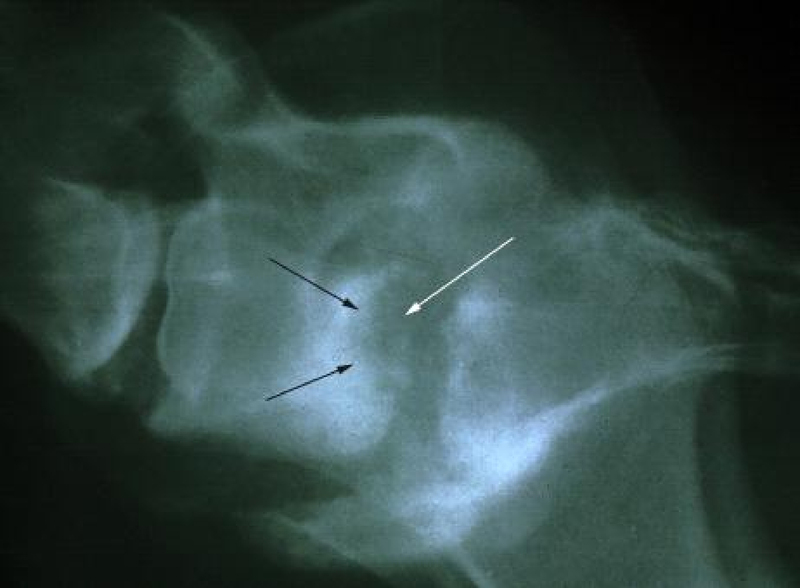 Their main value is to identify fractures of the spine as well as tumors and infections that destroy bone. They are not very useful for identifying disc herniations as it is often very hard to see the exact position of disc material clearly. 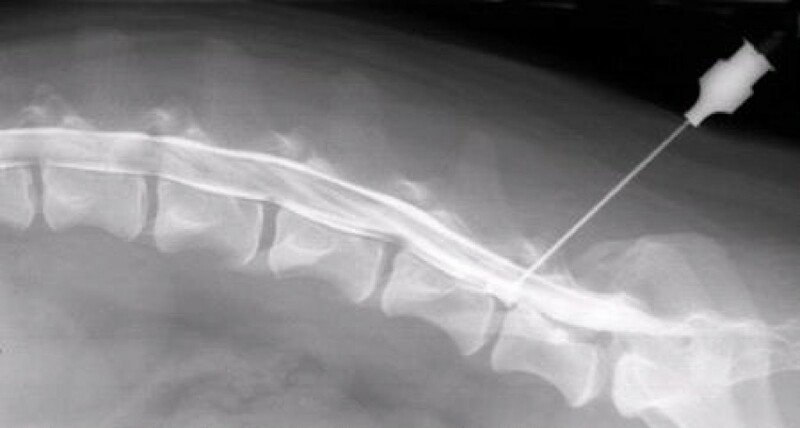 Figure 18-2: X-ray of a dog with a bacterial infection of the disc space at the lumbosacral junction. There has been marked destruction of bone (black arrows) and the normal plate of bone adjacent to the disc has been destroyed (white arrow). 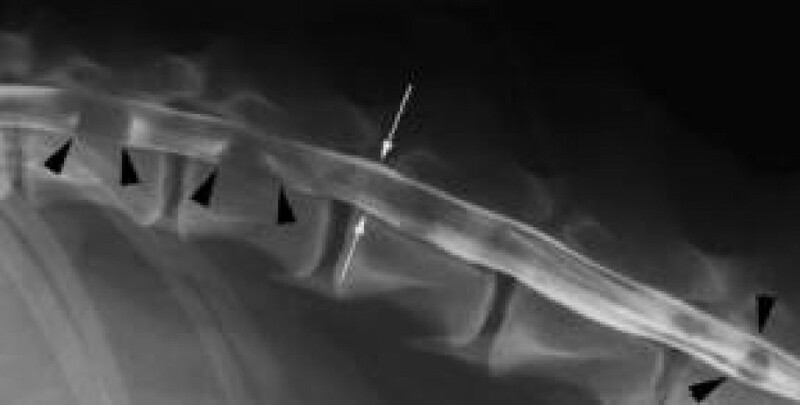 Myelography is a technique where an X-ray is taken after a contrast agent (a type of dye with similar properties to barium) is injected into the fluid (known as CSF) that surrounds the spinal cord. Myelograms are shown in the images below and also in Wobbler Syndrome. Figure 18-3: The dye is introduced using a needle as shown above. The dye then outlines the spinal cord and identifies any structure deforming it, such as a disc herniation (see Figure 18-4). Figure 18-4: Myelogram in a dog with a large disc extrusion in the neck (white arrow). The mass of disc material is pushing the myelographic contrast agent (black arrowheads) and the spinal cord upwards and will cause severe pain and weakness. Ultrasound is used most frequently to look at your pet’s abdomen or heart but we sometimes use it to look at the brain or spinal cord. An example of the potential use of this approach would be in a toy breed dog with a hydrocephalus and a fontanelle (the small, soft region on top of a baby’s skull that is also present in many toy breed dog’s as well). CT scan is an X-ray technique where a computer is used to reconstruct cross-sectional images of the animal in the scanner. CT provides invaluable information for surgical planning of many spinal cord disorders. We now use CT almost exclusively for the diagnosis of disc disease in dogs and cats because it is fast and accurate. In contrast to myelography, CT scanning is also a non-invasive technique. Extruded disc material can usually be seen without the need for a contrast agent. Examples of CT scans are also shown in Figure 18-5, below and under Vestibular Disease, Lumbosacral Disease, Nervous System Tumors and Meningitis, Encephalitis, Myelitis. Cross-sectional imaging such as CT (See Figure 18-5, below) and MRI also permit the brain to be examined in detail. Figure 18-5: CT scan of a dog’s head showing the skull (white arrow) and a large tumor near to the center of the brain (black arrow). The tumor has a rim of bright, contrast enhancement along with a darker center that probably represents poor blood flow. CT Myelography is where a CT scan is done after a myelogram. The reason to do this is that although CT shows the bones of the spine very well (see Figure 13-2) it does not show the spinal cord clearly. The myelographic contrast shows outlines the spinal cord very well and allows an accurate diagnosis to be made in many disorders that are not explained by CT alone). 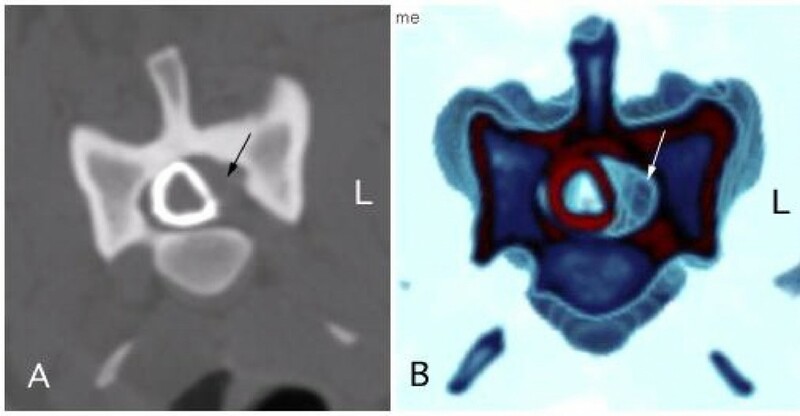 Figure 18-6: CT myelogram at the C5-6 disc space in a 2-year-old Mastiff showing marked, left-sided spinal cord compression (arrow). B: 3D reconstruction of the same CT scan as shown in A suggests that the spinal cord compression was caused by an out-pouching of the joint on the left side (known as a synovial cyst). MRI is an extremely useful technique that employs a powerful magnetic field instead of X-rays to enable a computer to produce an image. It is the gold standard imaging technique for many brain disorders and spinal cord as it depicts anatomy in exquisite detail. In contrast to CT scanning, MRI can be used to image an animal in either a longitudinal or lengthwise manner (sagittal plane) as well as in a cross-sectional manner (transverse plane). MRI can also be very useful for certain spinal cord disorders, although it may not quite give the resolution of CT, particularly for smaller animals. Like CT, MRI is also non-invasive. We are fortunate to be able to use the state of the art scanner at MRI Vancouver. Examples of MRIs are shown in Figure 18-7, below as well as under Disc Disease, Seizures, Lumbosacral Disease, Fibrocartilaginous Embolism, Nervous System Tumors and Magnetic Resonance Imaging. 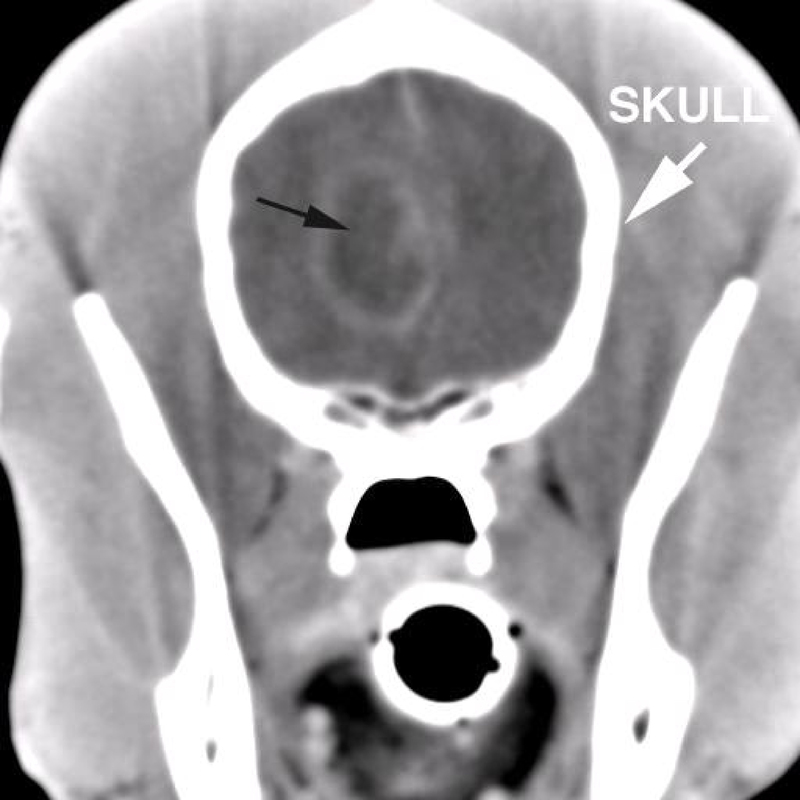 Figure 18-7: MRI of a dog’s head showing the skull (white arrow) and a tumor at the base of the brain (black arrow). The tumor has enhanced (been made brighter) with the contrast agent and so it appears light grey compared to the surrounding, normal brain tissue. X-rays: Department of Radiology, Bethesda, Maryland. Myelography: School of Veterinary Medicine, University of California, Davis. Computed tomography: Department of Radiology, Bethesda, Maryland. Ultrasound: Department of Radiology, Bethesda, Maryland. Imaging Tutorial: (for Human Patients). Doctors Groover, Christie, & Merritt, P.C., Washington, DC. Radiology Resource Information: (for Human Patients). Radiological Society of North America. Neuroimaging. JC. Jones. In Clinical Neurology in Small Animals: Localization, Diagnosis and Treatment. K.G. Braund. Reference List. Neuroradiology Links: – The Best (Human) Educational Internet Sites. Department of Neurology, University of Debrecen, Hungary.